On a sweltering day when Clay insisted on no fans (literally! ), we still toughed out a podcast. 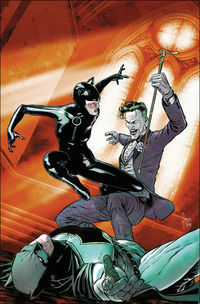 This week, two different Joker showdowns in Batman #48 & #49, the X-Men: Gold Wedding Issue, Tony Stark: Iron Man #1, Multiple Man #1 and Old Man Hawkeye #6. That's a lot of comics for a hot day. Click Here to Buy from TFAW.com, even though we gave it a bad review. I mean, just terrible.